Turns out, I did. In 2011, I attended the Lori Foster Reader/Author Get Together (RAGT) and won, like, everything. I scored a Kindle, a basket of Beth Kery books, and a ten page critique with Mags’ publisher. Mags helped me to edit the crap out of an original story I’d written for a group I’d joined on LiveJournal. After two months of intense reconstructive surgery, my baby was ready. I subbed it and held my breath. Fast forward to April Fools’ Day, 2012. I learned on the most fitting of days that I was going to be published! I remember calling my parents, who were in Florida at the time, and sharing the incredible news…and they didn’t believe me! “Sure, Julie,” they said. “Happy April Fools’ Day to you, too.” I cried, because I was in a highly emotional state, and said, “It’s true, you guys! And, you probably won’t believe this either, but I got into all four teachers colleges I applied to! Do you seriously not believe me? Why aren’t you celebrating with me? Whyyyyyyy? !” More dramatic blubbering ensued until finally, finally they realized my story was legit and their screams of joy woke up the entire condominium. Sorry, Floridians. I became published for the first time in August of 2012. Since that day, I’ve had nine short stories published. You know, I always thought that would be my specialty, the short stories. But the publishing industry is constantly changing, and the demand for short stories has all but disappeared. So, that left me with only once choice: write more. A daunting task. I only knew how to write short stories, or so I thought. And the very idea of writing a novel terrified me. They’re just so…big. So complex. There are so many characters and storylines and you have to keep track of all these little details throughout and your characters need to change over time and you need more than one conflict and everything must end in a happily ever after. Sheesh. Instead of reaching for the moon, I shot for the stars and wrote a story that hit novella-length. For me, that was a HUGE accomplishment. But, by the time I started subbing it to publishers, they were all SO OVER novellas and wanted something bigger. Great. I loved my story. I couldn’t just abandon it and start over. I believed in it. What could I do to flesh it out a bit more? Could I turn it into a series? How? Enter my fairy godmother, Kristan Higgins. During the Connecticut Fiction Fest, Kristan took me out to dinner and asked me about my writing projects. I told her the struggle I’d been having with my story and how I thought that I might be able to turn it into a series. That’s when she came up with the brilliant idea to try the Love Actually approach–introduce characters who aren’t really connected to the hero and heroine, and yet they influence the outcome of the story without really even knowing it. But they all have their own stories that are happening simultaneously, which we’ll delve into further throughout the series. How cool is that? But how could I take this supremely cool idea and do it justice? How could I, as Tim Gunn would say, make it work? Enter Mags, who also gets the title of World’s Best Brainstorming Buddy. She helped me to take my crazy scribbled notes post-Kristan dinner and turn them into beautiful, wonderful scenes that actually flowed with the rest of the story. I’ve been doing the NaNoWriMo thing to help motivate me to write this story to its proper conclusion. It’s not finished. Not just yet, but I can say now, for the first time in my life, that I’ve written something novel-length! Holy crap, I did it! 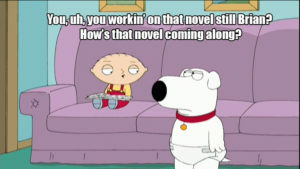 I’m a novelist! Sweeeeet! Good Job! Also I didn’t know about that story with your parents on April Fools LOL So funny. Thank you! 😀 It’s so perfect, right? It’s my favourite day of the year now…besides Christmas. And my birthday. And Easter. And Halloween. And Thanksgiving…. Thank you for the birthday wishes, but more, thank you for being right by my side for this whole crazy ride. You are the best of the best, and you never fail to amaze me, I tease about the ‘novelist’ bit, but I am terribly proud of you. I’m also super excited about the new, expanded STEEPED IN LOVE. You know I have adored this story from the start. I can’t wait to read it through with the new scenes added! I wish you nothing but luck with your full-length novel. Should I capitalize full-length? That’s a big deal. FULL-LENGTH! 😀 Yay! Capitalization AND an exclamation mark! You really DO love me! Thanks, Mamalu! You are as novel as they come! (And I love you for it!) With Mags and Kristan giving you guidance and your own fabulous talent, I know we’ll be celebrating your full-length success before you know it. Aww, thank you so much, A-M! You’ve been SO supportive of me the whole way through, and I love you for it! Congratulations on becoming a novelist. When I wrote my first book I told no one other than my wife what I was trying to do because I was afraid I couldn’t actually do it. Sixteen books later, I’m still not sure I’ll be able to finish another one. I envy how you found your gurus when you needed them. I think women are better at that than men, who (in my personal experience) feel they have to reinvent the wheel. I love my gurus! I’m so very lucky they came into my life when I needed them the most, and my mom, even since her death, is still with me every day. I still hear her words of encouragement. Yep, it comes down to the love of writing. Let’s face it, no one is going to weep if I never write another book; I would continue getting up every day and live my life. One day I suppose I won’t feel like writing anymore, and that’s fine … but until then, the love of writing will keep me going. Oh, I think Effing might weep. 😉 I might, too. Keep doing what you love, and I’ll do the same! Previous post Weekend Writing Warriors #16! Next post Weekend Writing Warriors #17!